Serving doubles at the breastfeeding bar, straight up with a twist of peaceful parenting. A reported 27% of childbearing-aged women were sexually abused in childhood, and an estimated 40% including adolescent/teen years. According to LLLI, 90% of abusers are male, 70-90% are known to their victims; and for girls, 30-50% of abusers are family members. These are just numbers. Numbers don’t speak, but many of the individuals behind the statistics are doing just that. Sexual abuse causes lasting trauma that cannot be isolated by a number; it follows the victim throughout life, and if this person is a woman on a path to motherhood it has many specific, new chances for recall of its memory. Pregnancy, birth, and breastfeeding bring enhanced susceptibility to a woman’s life, leaving her in jeopardy of rewounding. You might assume that women who were sexually abused would be more hesitant to attempt breastfeeding than other mothers, but in fact the opposite has been found to be true. In a nationally representative sample study, women who self-reported past sexual abuse were more than twice as likely to initiate breastfeeding. They also were found to breastfeed at the same rate as those without a history of past abuse. However, women who were or are currently sexually abused are at greater risk for postpartum depression, disturbed sleep, and perinatal complications. Interestingly, exclusive breastfeeding has been shown in a study to reduce rates of depression and poor sleep among survivors, as compared with formula feedings and mixed feedings (read about the study’s background and a podcast interview with the author here). Still, night feedings are often especially frightening for survivors of abuse. They may have an especially difficult time managing views of breasts as both sources of nourishment and sexual objects. They may also have significant anxiety around the exposure and vulnerability brought on by public nursing. Sterile, cold, impersonal interactions with health care providers may decrease their willingness to seek assistance for breastfeeding problems. The consequences of how mothers are treated in health care situations take root in well-woman exams, then trail her into prenatal care, birth, and finally into her breastfeeding journey. Past sexual abuse can affect how a woman approaches medical authority of whom she would expect to provide support, assistance, and responsible care when in need of breastfeeding help. Sexual abuses are an example of undermining of a survivor’s personal power and authority; the abuser takes advantage of their place in a trusted position. Being forced to work with medical authority in a similar dynamic can be all too reminiscent of past abusive exchanges. This increases the chance that a survivor cannot feel confident to confront or question her care provider without emotional or physical ramifications. “Whether the experience is traumatizing or healing might well depend on the skills and sensitivity of the health professionals providing care,” wrote Karen Wood and Penny Van Esterik in their study on childhood sexual abuse victims who went on to breastfeed. Some women expressed embarrassment at the notion of their bodies being seen publicly, and others admitted feeling guilty over a perceived inability to bond with their children. Many women experienced emotional challenges to being touched by their infants, having to touch certain parts of their own bodies during feeding, and touch by health care providers (especially when unexpected and uninvited). Some women see their breasts as the cause of their abuse. Though many women have largely depressing experiences with breastfeeding their infants, many others find the new relationship to be a tremendous source of pride — empowering and significantly healing. By nourishing babies with the power of our bodies, fear and stigma have the chance to transform into confidence and a sense of self-value. *Quotes were extracted from this study, this story, this article, an information sheet from South Eastern Centre Against Sexual Assault & Family Violence, and provided by women who wished to share their experiences for this post. “Too Much Touch” by Sara L.
If you’re struggling with breastfeeding as a sexual abuse survivor, the most important thing to remember is: it is NOT your fault. The next most important thing to know is: you are NOT alone. Be clear about your boundaries with any breastfeeding helpers including hospital staff, lactation consultants, well-meaning family members, and so on. For example, you can state that you do not want your breasts to be touched or that you need space while nursing. A partner can be tasked to advocate for you if you feel uneasy speaking up. Older infants and toddlers often play with, pinch, grab and otherwise touch their mother’s breasts while feeding. This is normal behavior that may surprise abuse survivors, who may wish to prepare a plan regarding teaching ‘breastfeeding manners.’ Other ideas include using a nursing necklace, holding baby’s hand, plus more here and here). Learn about covering methods for nursing in public if the thought of visible breastfeeding gives you anxiety (ideas here). Practice nursing in front of individuals of whom you trust to build confidence before taking baby out. Nighttime feeds might feel scary. If they become truly intolerable, have a partner feed baby with expressed milk at night while you pump. Finding a safe place to nurse with adequate lighting can help. Set an alarm for scheduled feedings during the night to avoid the being woken up by a person instead. Distraction techniques can lessen emotional distress. Some ideas include reading, watching television, listening to music, or texting/talking on the phone while nursing. Know that strong sensual feelings may be experienced while breastfeeding. This is normal; these feelings are not sexual in nature. Experiment with clothing. If too much touching is a trigger, try nursing baby with a receiving blanket between you as a barrier. Contrarily, you can try increasing skin-to-skin feeds (baby in nothing but a diaper, your top is removed). This can help you associate baby’s touch with love and bonding; the oxytocin hormones generated help turn pain sensations into more pleasant ones. Increased sensitivity to pain or feelings of numbness and disassociation can be related to prior sexual trauma. This are not caused by the mother and does not preclude her from being a “good” mother or a successful breastfeeding mother. Breastfeeding beyond infancy is a valid choice. It is not indicative of deviant sexuality. The World Health Organization recommends breastfeeding for a minimum of two years and beyond for as long as the mother and child mutually wish. Nursing aversion has been linked to prior sexual trauma. Nursing aversion has psychological symptoms with an oft-mysterious root cause, though at times it can be attributed to hormonal shifts or lifestyle choices. This is BY FAR the number one breastfeeding issue about which I receive worried messages. Solutions found here. Timing feeds with a phone alarm is an effective way to feel more in control. This can help not only with phases of aversion but also make the chaos of infant feeding a more organized, conquerable task, and give you a chance to (literally) count on something reliable. You may feel threatened by the idea of sharing your body with your baby, or feeling out of control. Managing nursing sessions with more of a routine can help. Scheduling daily time for self care is essential for connecting with your own body. Offering to breastfeed instead of always waiting for baby to demand it can also help you feel more autonomous. If you have historically used drugs or other risky mechanisms of coping with painful wounds, seek professional assistance to find resolve in a way that won’t endanger your health or damage your breastfeeding relationship. Open, regular discussions and early treatment with a mental health provider can help prevent progression into a postpartum mood disorder such as postpartum depression, postpartum anxiety or postpartum psychosis, of which survivors are at higher risk. Let breastfeeding helpers know how you want them to react in the event that you choose to wean. They should be educated about the harm of pressuring a mother to continue breastfeeding, and should be prepared to unconditionally support her decision. Likewise, helpers should be advised to keep negativity to themselves should a mother choose to breastfeed past the helpers’ personal point of comfort. Remember, even if you’re breastfeeding, your breasts are YOURS, your milk is YOURS, your decisions regarding breastfeeding and for how long are up to YOU. 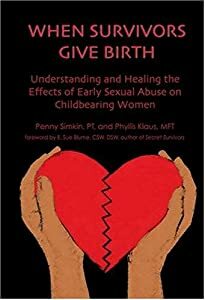 When Survivors Give Birth: Understanding and Healing the Effects of Early Sexual Abuse on Childbearing Women, by Penny Simkin & Phyllis Klaus. Available at Amazon.com.